Good Morning & Happy Saturday Everyone! Welcome to another Etsy day!!! Our featured shop for this week is called Enchanted Beehive and they specialize in unique, handmade soaps, pendants & candles. They're offering 2 lucky winners 1 item of their choice from their store and our sponsor *Doodle Palace* is graciously giving away 5 digital images to another lucky winner!!! Please visit the Etsy Challenge blog for all the details on the prizes being offered this week. How do you win? Just visit the above shop, pick your inspiration, make whatever creation your heart desires & link it to the EtsyInspired Challenge Blog. Thanks so much for stopping by and have a great rest of the weekend!! Jackie, This is just beautiful. Love the color combo, borders, and layout. Thanks for the inspiration. Beautiful card Jackie. I have not been too keen on those felt flowers - but your card has made me love them! Such a great color combination and that pink satin ribbon is gorgeous. I love your card too! This is gorgeous! I'm tickled pink because I need a pink and brown card for a swap coming up and your card has inspired me! TFS! Such a pretty card! Love those hearts and that gorgeous pink ribbon. Stunning card, Jackie! The colors are fantastic. Love the flower! Totally cute!! Love the pink and chocolate! Chocolate and pink...such a pretty color combination! Love the hearts and adorable felt embellishment! Wow! This is gorgeous! Love the pink and chocolate - Just a great card. This is so pretty Jackie! I love the hearts, flower, and pretty pink ribbon! Just go girly and pretty! Just lovely Jackie! Perfect in everyway. Sorry I haven't been visiting lately, FB really bogs me down and I need to let some of the 'games' etc. go so I can get back to the important things. Just updated my blog with a bithday card and am stopping by to visit some of my friends. Very pretty Jackie, love pink and brown together! Jackie, what a beautiful card! The colors go so well together and the layout is so nice! Wow that is beautiful Jackie! This is adorable! I have to get in gear and try this challenge - hehe. Love this. 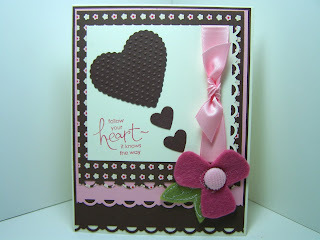 I love pink and brown together and this card is the perfect balance, and Oh-so-cute! Love your card! I can't wait to get my hands on some of those flowers!! Your card is delightful!! I love that DSP and the felt and ribbon make this card super special! Jackie, This is a beautiful, elegant card. I admire how you are always able to make something so lovely for the etsy challenges. Love your beautiful heart creation, Jackie!! What a wonderful card!! 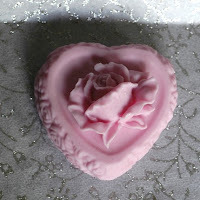 And this pink rose soap would inspire anyone!! How gorgeous!! A gorgeous card. Love the colours. Looks like you used the CB to emboss the texture on the heart. That is a great idea. Such a beautiful card Jackie! I really like the felt flower and double row of border punching. I love this, Jackie!! Your layout and design is really beautiful! It's me again! Your card inspired the one on my blog today! check it out if you have time. I also put in a link to your card and your blog, so hopefully others will show up to enjoy your beautiful creations! This is lovely Jackie. Love that pink satin ribbon, I just got mine yesterday. That is an aboslutely beautiful card. TFS! Gorgeous!! love the colors and those dots on the heart are just fabulous.